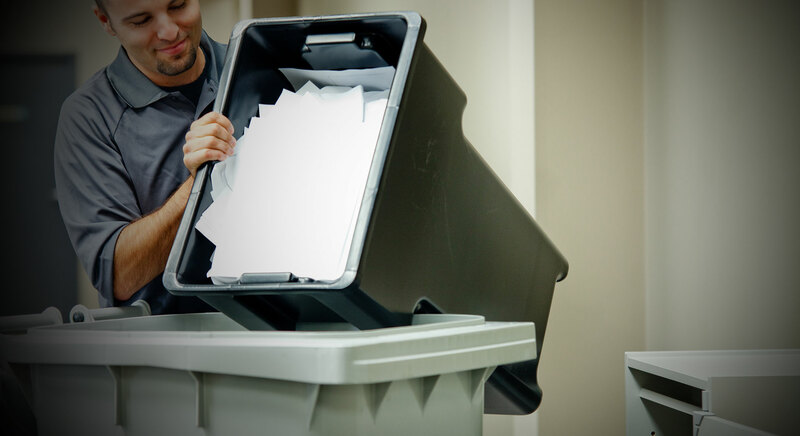 We can deliver and install a shredding bin of your choice: Console, 65 or 95 Gallon Containers, our company collects, transports and destroys the confidential documents in the most secure, compliant and environmentally-friendly manner. We offer multiple options for Document and Data Destruction Programs, including options to mix and match container sizes to fit the policies, procedures and office furniture setting for your business. Scheduled Container Pickups are designed for customers in need of scheduled shredding or media destruction based upon policies determined by the company, their industry and/or their waste capacity. We service these bins as needed, you decide how often you need them serviced or simply call when they get close to full to schedule pick up. 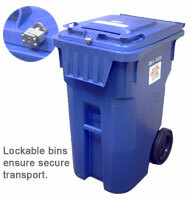 We will place locked, labeled containers in easy-to-find locations on your business’ property. After a pickup schedule has been determined, our Service Representatives will arrive at your location on your scheduled pickup date. They will collect and transport your labeled container(s) to destroy its contents at of our restricted access facilities. Busy office where the shredding material is generated daily. Data Security: Ensuring materials are being destroyed consistently and securely. Businesses needing a Certificate of Destruction to maintain and record compliance with HIPAA, FACTA, SOX and State Privacy Laws. Cost: Most cost efficient without having to spend labor and capital on shredders, average shredding job is $100 per call. Our friendly and well-trained Representatives will place secure, containers on your property and as instructed. When your material arrives at one of our locked, restricted access facilities, it will remain under continuous video surveillance until it is weighed and destroyed. We unlock your container(s) and weigh your material on a scale professionally calibrated by a 3rd party vendor. A short conveyor transports your material from the pit into our shredder machine for destruction then compressing it into dense bales. The bales are then transported to a secure recycling mill. And finally, we provide your business with a Certificate of Destruction. When the bins are full (in a month, a week, or year) you call to service them and we bill you a flat $100 per bin! No contracts, no hidden fees. Period!